There's nothing I like more in this world than an upset at a major international hockey tournament. It really reinforces the idea that, on any given day, anyone can beat anyone else. It happened in Salt Lake City when Belarus defeated Sweden in the quarterfinals, and really turned the hockey world upside-down. Vladimir Kopat's 70-foot slapshot put the Belarussian hockey program on the map in terms of the Olympic stage, and forced major changes in the Swedish hockey program. Upsets happen, though, and that's why I love hockey - anyone can literally beat anyone else on any given day. Looking at this year's World Hockey Championships that are taking place right now in Bern and Zurich-Kloten, Switzerland, there have been a number of scares and a few upsets that have started to change the power hierarchy in the international hockey world. The first game that showed that the lesser-known teams came to play was the Switzerland-France game on April 24. Switzerland barely survived a 1-0 game as the French team played a superb game. A powerplay goal in the first period by Martin Pluss stood as the winner for the Swiss squad, but French goaltender Fabrice Lhenry was the story as he stopped 41 of 42 shots to give France a shot at a major upset. The first major upset of the tournament came on April 26. Slovakia matched up against Belarus, and the Belarussians didn't back down from the Slovaks. Andrei Stas opened the scoring for Belarus in the second period. Andrei Mezin, the same goaltender who was in net in Salt Lake City, almost shutout the Slovaks, but Marcel Hossa tied the game with just under three minutes to play. Overtime solved nothing, but the shootout did. Oleg Antonenko scored both of Belarus' shootout goals, and Slovakia could only put one puck past Mezin, giving Belarus a 2-1 victory over Slovakia. The next upset came the very next day, on April 27. Latvia and Sweden squared off, and it was expected that the Swedish team should be able to handle the Latvian squad. Linus Omark put the Tre Kronor up 1-0 in the first period while outshooting the Latvians by a 13-6 margin. Latvia, however, wasn't fazed. Krisjanis Redlihs and Lauris Darzins replied for the Latvia in the second period to give the Latvians the lead going into the third period. Magnus Johansson tied the game up, and Latvia held the fort right through overtime, leading to a shootout. In the shootout, the final Latvian shooter ended the game as Aleksandrs Nizivijs scored to give Latvia the 3-2 shootout win, and a 3-2 final score. France's close call against Switzerland had to have built confidence in the Frenchmen. Their April 28th game against Germany was just the right time for France to post their first win if they could play as well as they did against Switzerland. Well, Anthoine Lussier got France on the board first before Jochen Hecht tied the game midway through the first period. France did strike again before the end of the first, though, as Luc Tardif put France back on top. From there on, it was all Fabrice Lhenry as he stopped 30 of 31 shots to give France the 2-1 win. Another lesser-known team knocks off a team who has some modest international success. April 30 saw Latvia coming off their win over Sweden into a game against the host Swiss team. Could they pull off another win over a moderately-successful team? Martin Cipulis started the Latvians off on the right foot as he opened the scoring in the first period. Like Belarus against Slovakia, goaltender Edgars Masalskis almost made it through sixty minutes, but Andres Ambuhl tied the game with 1:31 remaining. Meaning we were off to overtime again. And nothing was solved there, so we're back to the shootout. Wouldn't you know it? Aleksandrs Nizivijs scored the only goal of the shootout to give Latvia a 2-1 win over Switzerland. Latvia's second shootout win in the tournament moved them to the qualifying round - a huge accomplishment for that team. Now, you're probably thinking to yourself that both France and Latvia - juggernauts in this tournament - had to have played each other, right? No, they did not. But have no fear! They square off in the qualifying round on May 2! Belarus has a game on May 2 against Finland which will be a much tougher test, but stranger things have happened. The rest of the tournament schedule can be found here, but I'm hoping there is at least one more upset. It's why I love hockey. Oh, and just because I'm a homer, GO CANADA GO! There has been a lot of talk from both the Canucks and Blackhawks about being ready for each other as they embark on their paths towards the Stanley Cup. The Canucks were the first to bring up the line brawl on March 29 which, according to a few Canucks, is still fresh in their minds. The melee on the ice that took place involved a number of questionable moves: hair-pulling, bodyslams, enforcers squaring off against goal scorers. And it seems that none of this has been forgotten by the Canadian team. That should make the Round Two matchup between the Canucks and Blackhawks very, very interesting. First, let's go back to the incident. Now, obviously there would be some unhappiness on the part of the Canucks after Dustin Byfuglien hit goaltender Roberto Luongo in the face. That's completely understandable, and I would assume that Chicago is going to use every trick in the book to try and get Luongo off his game. Including bumping into him. Which means we should see more of the above in the series. "Back then it looked like we were going to meet in the first round," Blackhawks enforcer Ben Eager said to The Associated Press. "We just wanted to show them it wasn't going to be an easy series and we were going to play hard." Well, Chicago showed Calgary that they were here to play, and they took it to the Flames. However, in the Canucks, the Blackhawks will find a pile of sandpaper scratching back. Alex Burrows, Ryan Kesler, Shane O'Brien, and Kevin Bieksa all like to throw hits, so it won't be as easy for the Blackhawks to enter the offensive zone as it was in their previous series. "Obviously we have dislike for them," said Canucks defenseman Kevin Bieksa to The Associated Press. "Is it more than some teams? Maybe, but it will make for a good series." Alex Burrows added his thoughts on how the Canucks should be able to win the series. "We can't take 24 penalties in four games, that's going to kill us. There will be physical play, but I wouldn't bet on a line brawl right off the bat. We have to take a punch to get a penalty and make sure we go on the power play instead of going on the PK all the time." With all the weapons that Chicago had, Burrows has hit the nail on the head. Chicago went 7-for-24 in their series for Calgary, so their powerplay was a large part of their first-round victory. Vancouver's penalty kill was sharp against the Blues, but the Blackhawks feature a number of snipers who shoot to kill. All in all, I expect a very physical matchup between these two teams, and it should be an enjoyable series. Lots of hits, lots of great saves, and a pile of goals are to be expected. This might be the best Round Two series that no one east of Chicago will care about. And I'm pumped for it more than Washington-Pittsburgh. Well, the first round of the NHL Stanley Cup Playoffs are over, and there was some considerable heartbreak in some cities. The Rangers blew a 3-1 series lead as the Capitals advanced. The Devils, leading 3-2 with three minutes to play, watched Jussi Jokinen and Eric Staal score to eliminate them. The Flames collapse down the stretch and into the playoffs continued as the Blackhawks eliminated them. The Sharks, proving that they can't win a big game, collapsed under the pressure of the Ducks' intense forecheck as they were eliminated 4-2 in their series. So where does that leave the hockey pool participants? Well, last year's winner, Justin St. Louis, is leading this year's pool again, proving that his estimations on how long series will run is just as good as his picking of individual players. However, there are a number of people within striking distance, and that's why we keep track of the points. Even the people at the bottom of the pool can make a run with some wise picks in this round. All it takes is a little luck, and some good guesses. Here's who won each series in the pool by points. Some of these guesses are amazing, while others show that we may be way off in our estimations. Boston vs. Montreal: Winner - Connie Kim, Sammy Barbour, Justin St. Louis. All three participants picked the Boston sweep for four points plus an additional five points. Washington vs. New York: Winner - John McEnaney. John correctly predicted the winning team in Games 2, 3, 4, 5, and 6, and also called the game-winners in Game Two (Semin) and Game Three (Drury) for a total of nine points. New Jersey vs. Carolina: Winner - Dan Franko. Dan correctly predicted the winning team in Games 1, 2, and 7. Dan also called Parise in Game One for the winner, and Staal in Game Seven for the winner. Because Dan called the Hurricanes to win in seven games, he also receives an additional five points, giving him twelve points in this series. Pittsburgh vs. Philadelphia: Winner - Luigi Perillo. Luigi picked the winning team in all six games in the series for an easy six points. Simon Gagne's game-winning goal in Game Three added another two points to his total in this series. And because he correctly predicted Pittburgh in six games, Luigi received an additional five points for a total of thirteen points in this series. San Jose vs. Anaheim: Winner - Dave Frolick. Dave correctly predicting the winning team in Games 3, 4, and 5 for three points. He also called Patrick Marleau's game-winning goals in Games Three and Five. Amazingly, seven points was the highest total in this series of all the participants. Detroit vs. Columbus: Winner - James Huening, Mike Engle, Kirsten Barta. All three participants picked the Detroit sweep for four points plus an additional five points. Vancouver vs. St. Louis: Winner - Mike Jaworski. Mike was the only participant to correctly predict a Vancouver sweep, giving him four points for each correct game and an additional five points for naming Vancouver in four games for a total of nine points in the series. Chicago vs. Calgary: Winner - Justin St. Louis. Justin amassed the highest point total of the first round in this series. He called the winning team in each game for six points. He also predicted Havlat in Game One and Toews in Game Two as the game-winning goal scorers for another four points. And because he called Chicago in six, he receives an additional five points for a total of fifteen points in this series. 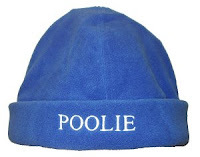 Ok, poolies, that's how the pool was won. At least in the first round, anyway. For the second round, get your picks in ASAP! The second round starts on Thursday. When you send your picks in please have the subject as "Round Two". Congratulations to all the participants, and start looking at the matchups for your second round picks! You know, it's tough to see a Canadian team go home in the Stanley Cup Playoffs. As a Canadian kid, I always want to see Canadian teams go as deep as possible in the playoffs simply because I want to see the Stanley Cup come back to Canada. 1993 is a long time when you consider that Montreal was the last Canadian team to bring home the Cup to Canada. However, I'm not sad to see Calgary go. Now, I don't expect to see a lot of Calgary fans come here and agree with me, but Calgary simply was outplayed by the Chicago Blackhawks, and that's the truth. Calgary was too slow, in this writer's mind, to keep up with the youthful Blackhawks. Speed kills in the NHL, and this was never more evident than in this series. Jonathan Toews, Patrick Kane, and Kris Versteeg blew by the Flames' defencemen routinely to establish a presence in the Flames' zone. Injuries to Robyn Regehr, Dion Phaneuf, and Mark Giordano significantly reduced the defensive zone speed for the Flames, particularly in Game Six, but Cory Sarich, Jordan Leopold, and Adam Pardy should have picked up the pace. Much like the New York Rangers in my last article, the best players on the ice for the Flames were not the highest-paid players. Eric Nystrom and David Moss were legitimately the best players night in and night out for the Flames. Yes, Olli Jokinen and Jarome Iginla led the way with their point totals, but they were hardly seen on most shifts. And it's tough to win any series when your goaltender is simply average. Kiprusoff, the 32 year-old, has not won a playoff series since 2003-04 when he played in only 38 games after being traded by the San Jose Sharks. In that playoff year, Kiprusoff took the Flames to the Stanley Cup Finals. Since that time, Kipper has averaged 75 starts over four seasons. Over that same time, the Flames have been eliminated in the first-round four straight times. Perhaps these stars are simply overworked? Is there any wonder why the Blackhawks won? There is a premium on youth in today's NHL, and every single team that has advanced so far has a bounty of young players on their teams. Boston? A fantastic mix of youth and veterans. Pittsburgh? Lots of young players along with some savvy veterans. Detroit? Great young players, established veterans, a pile of Stanley Cups. Vancouver? Solid young players with a few established, scoring veterans. Look, I'm not saying that youth wins championships. But I am saying that on all the teams that have advanced thus far, youth has played a huge role. And in grueling series like we've seen, younger bodies heal faster and recover quicker. That has a huge impact on any series. It's hard to fathom that the New York Rangers will be playing in Game Seven against the Washington Capitals after leading this series by 2-0 and 3-1 margins. Full credit has to go to the Washington Capitals for not giving up and playing hard to even the series at 3-3, but there is a distinct difference between these two teams - both on and off the ice. The Rangers look gassed out there, a team that has no legs, no heart, and no idea how to slow down the Capitals. There are a few standout players who are doing all they can, but anyone not named Lundqvist, Staal, Callahan, or Dubinsky should take a long look in the mirror over the next two days if the Rangers want to advance. Otherwise, it's time to break out the voodoo, prayers, and whatever other trinkets the Rangers can find to pull out one more miracle. Look, I'm just as surprised as anyone that the Rangers have made it this far when looking at the two teams. Washington features a ridiculous number of superstars, and the role players are doing everything humanly possible to help the stars. Ovechkin, Semin, Backstrom, Green, and Fedorov have led the team on the scoresheet while guys like David Steckel, Boyd Gordon, Eric Fehr, John Erksine, and Simeon Varlamov have come on and really made a difference for the Capitals. 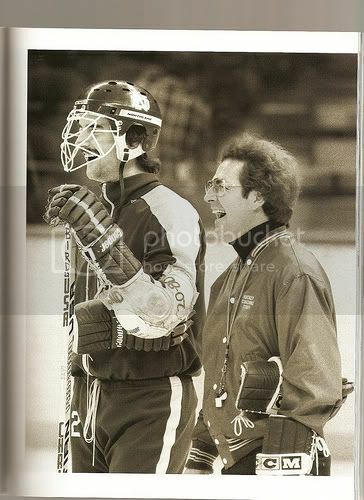 However, if I'm Rangers head coach John Tortorella, I'd be cursing the management style of Glen Sather at this point. Chris Drury, he of the $7.05 million cap hit, has a mere one goal and is a pathetic -4 in five games thus far. Nikolai Zherdev, he of the $2.5 million cap hit, has no points in six games while playing -2 hockey. And he missed two glorious opportunities today as well. Look, there is a lot of blame to go around, but the guys earning top dollar had better produce in the playoffs. Combined, the Rangers are paying Drury, Zherdev, Scott Gomez, and Markus Naslund $20.907 million this season. In the playoffs, where the stakes are much higher, those four have combined for four goals, nine points, and a -9 rating. That, quite frankly, is brutal. The only players who I have been impressed with in this series on the Rangers' side are Henrik Lundqvist, Ryan Callahan, Brandon Dubinsky, and Marc Staal. Combined, those four make $8.91 million with the majority of that number being made up by Lundqvist's $6.875 million cap hit. Combined, those four have four goals, six points, and are playing even hockey on the plus/minus. That says a lot when compared to the previous four players who are swimming in greenbacks. Lundqvist literally stole two games in this series already, and has shown that he is worth every cent the Rangers have invested in him. He is a world-class goaltender, and has given the Rangers the chance to be in every game in this series. Callahan has played effectively in a checking role, contributing two goals while being assigned to cover the Capitals' superstars. Along with Callahan, Dubinsky's role on that checking line has produced one goal and two assists, and he's playing +2 hockey. For a checking role, that's exactly what you want to see. Staal has one goal, but has looked very much like the blue-chipper that the Rangers thought they were getting. He has played well in his own end, and works hard to limit chances and block shots. As stated over and over on the NBC broadcast today, the Rangers' powerplay is horrible. In fact, there are a number of words that I could use, but some are less than professional. The five-on-three opportunity in the third period where the Rangers had no chances should be an indicator that there are serious personnel problems on the powerplay as well as a complete lack of direction on the bench. If I'm John Tortorella, I'd be declining the powerplay option and just asking the referee to knock two minutes off the clock. The Capitals get better chances shorthanded than the Rangers do on the powerplay. With the game coming up on Tuesday in Washington, the Rangers have one day to figure out how to pull off the biggest magic trick since David Copperfield made the Statue of Liberty disappear. The fact that they won three games should give them hope, but the last two games have been abysmal in terms of any team play. How they won three games against the Capitals is beyond me. The Rangers are nothing more than smoke and mirrors in this writer's eyes. And, with the salary structure of the Rangers, this smoke and mirrors show will continue for the next three-to-five years as well. Nice work, Mr. Sather. Thanks for nothing. The people that read this blog are phenomenal when it comes to their knowledge and passion for the game of hockey. Occasionally, I'll ask a question, and someone will answer it with amazing detail. 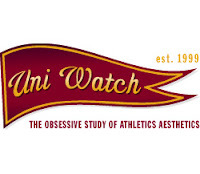 I also spend some time reading at Uni Watch Blog, and will occasionally ask questions there in order to take advantage of that community's sports knowledge. Really, it blows me away with how many great comments people make with excellent information. And that leads me to today. 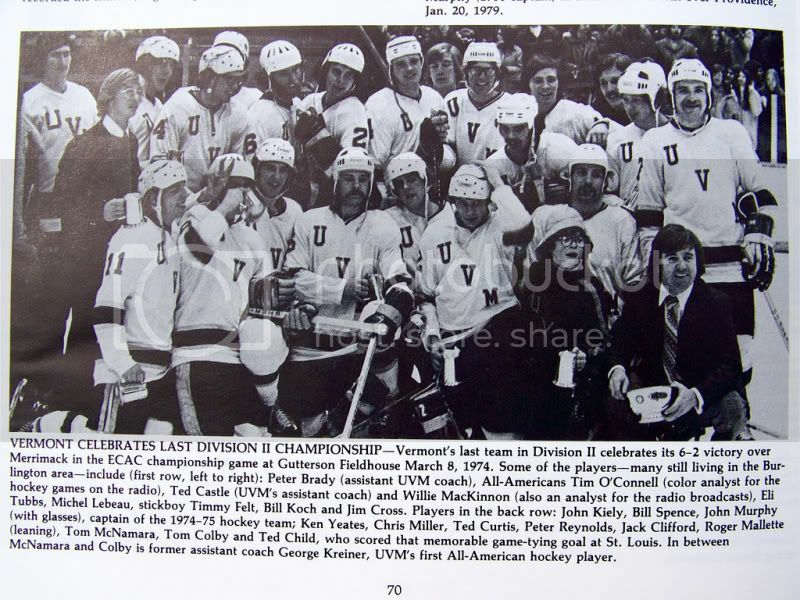 A couple of days ago, Uni Watch reader and NCAA hockey buff "triswykes" emailed me with a number of scans he had taken of various programs from the NCAA. He knew I had been searching for information regarding the RPI photos where some players appeared to be wearing facial protection that resembled goalie masks. 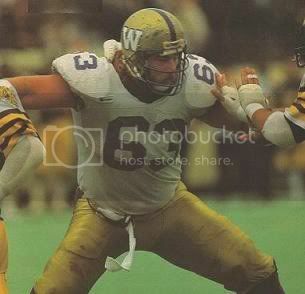 Thanks to triswykes, here is a whole pile of excellent olde-tyme photos from the NCAA. 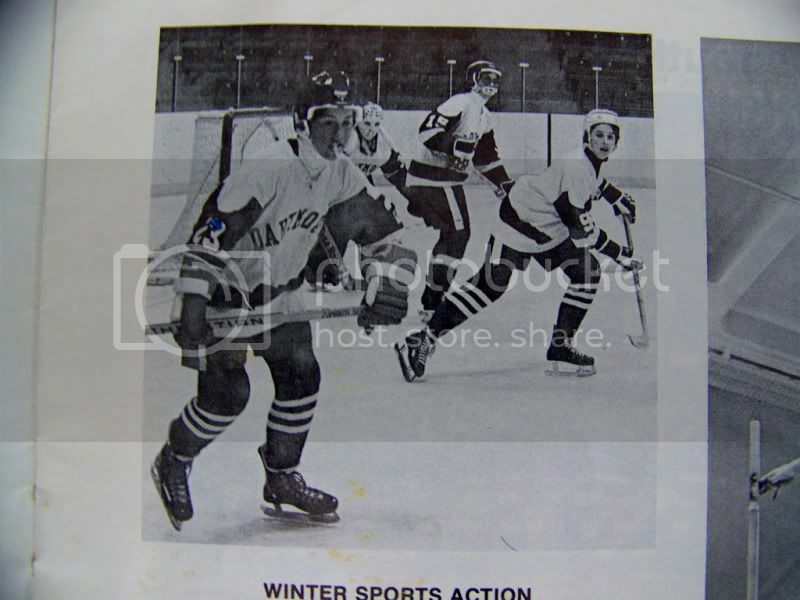 As you know, I love old hockey photos, so I am proud to present these on his behalf. They show a variety of cool things, and I'll point them out as we go through them. Bill Riley, Dartmouth, 1946. 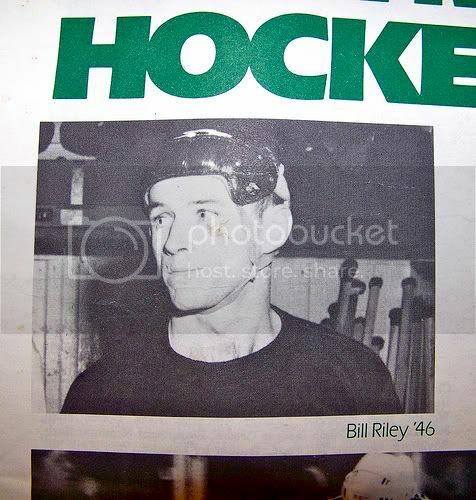 Riley's picture is slightly odd since the majority of players did not wear helmets in that day and age. Riley's helmet is clearly an early-style helmet, but the fact that he is wearing one in the NCAA is pretty neat. University of Vermont, 1974. What's neat about this picture is how there are a variety of helmets and gloves seen in the photo. Before sponsorship and equipment deals with major outfitters like Easton and Nike, players routinely wore what they either had or could afford. Pretty cool. Dave Reece, Vermont, 1971. Goaltenders have always worn some kind of protection on their faces since Jacques Plante got hit in the face by Andy Bathgate. But Dave Reece didn't. He just wore the helmet. University of Vermont, 1973. It's interesting to see the chicken wire separating players from fans rather than plexiglass. Olde-tyme arenas like the Detroit Olympia also used wire instead of glass. Note the three different helmets as well. Dartmouth University, 1976. Women's hockey hadn't been established as an NCAA sport yet, but that didn't stop these women. I'm not sure if the lady in the background is wearing some sort of facial protection or just a football-style chinstrap. And the woman in foreground should really keep her mouthguard in her mouth. Western Michigan University, 1970s. Not sure if these guys were getting ready to go off to war or not, but the guys on the bench wore helmets that gave you that impression. I'm digging the stripes on the socks, though. Princeton-Dartmouth, late-1970s. Interesting to see how Dennis Murphy's nameplate is basically tacked onto his jersey at the corners. I guess it would be easier to re-use the jerseys season after season that way. Also, interesting mask on the Princeton goaltender. Brown University, 1982. 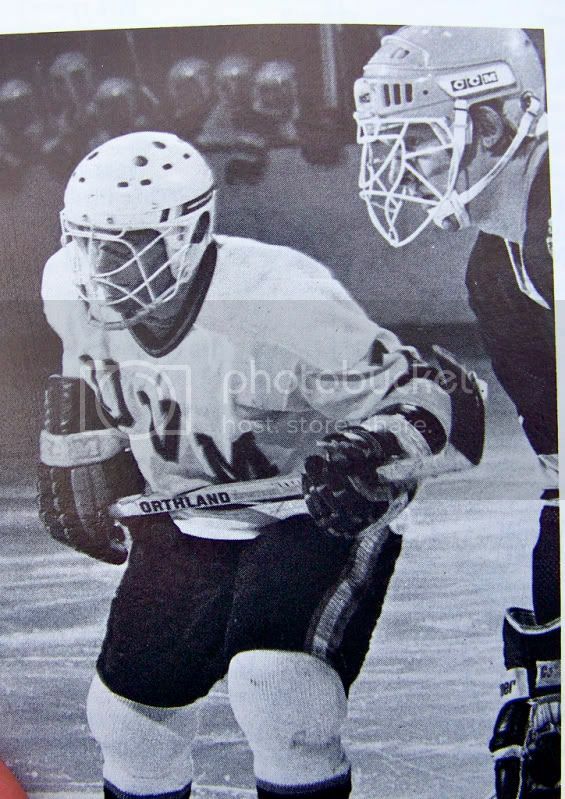 Facemasks and hideous helmets - welcome to NCAA hockey in the 1980s. Those ProTec helmets made the players' heads look like bowling balls. At least the masks fit, though. Brown University, 1981. 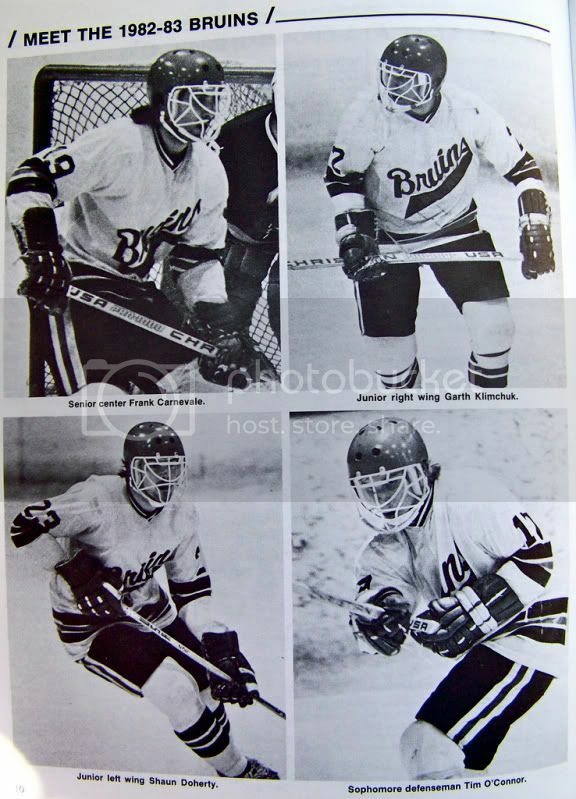 As you can see here, the NCAA was following the NHL's lead in that goaltending tandems were regularly seen wearing a couple of different masks. For more info on the evolution of the mask, please check here. Clarkson University, 1980s. The ProTec mask on the Clarkson player on the right was banned after a couple of seasons of use in the NCAA. The reason? It offered little in the way of protection. 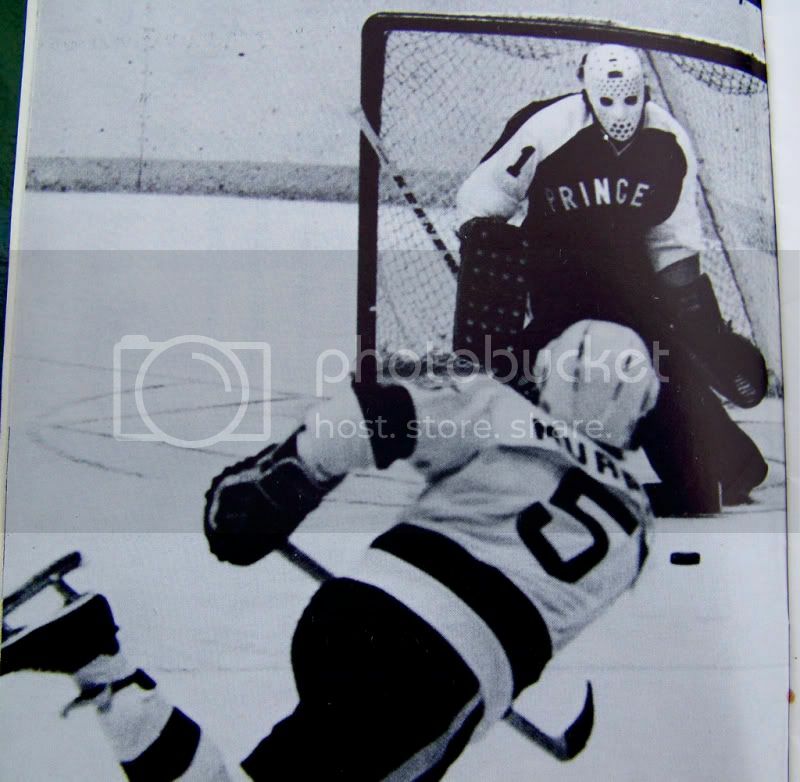 Pucks and sticks could still fit through the holes in the mask, and the way it bent outward allowed for high sticks to make contact with the face. Rob Scheuer, Princeton, 1980s. Here's another example of the illegal ProTec masks. 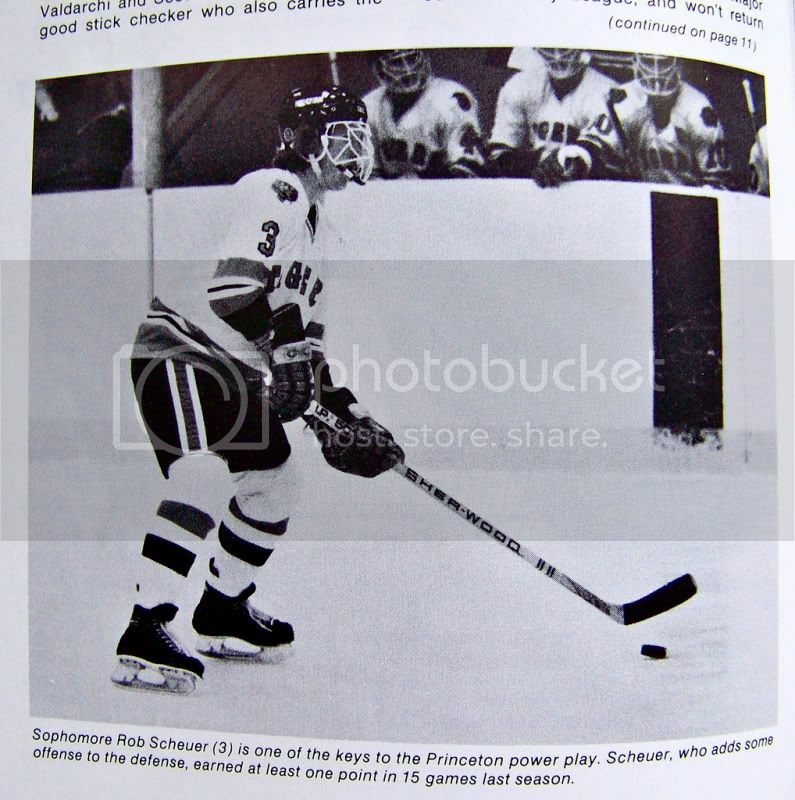 Defenceman Rob Scheuer doesn't appear to have much protection. 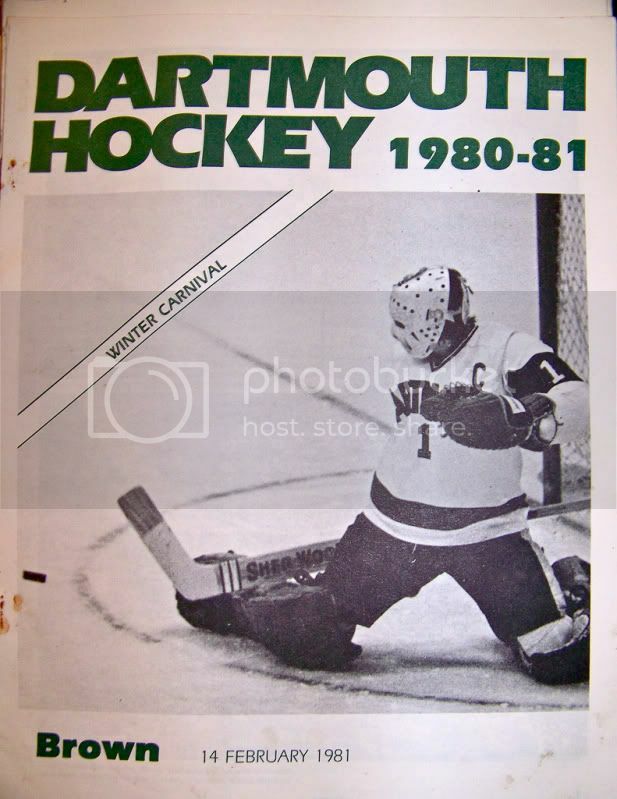 Bob Gaudet, Dartmouth, 1980. Was Roberto Luongo a Gaudet fan? Check out Gaudet sporting the captain's "C" on his chest. That's rarely seen in any hockey photo. 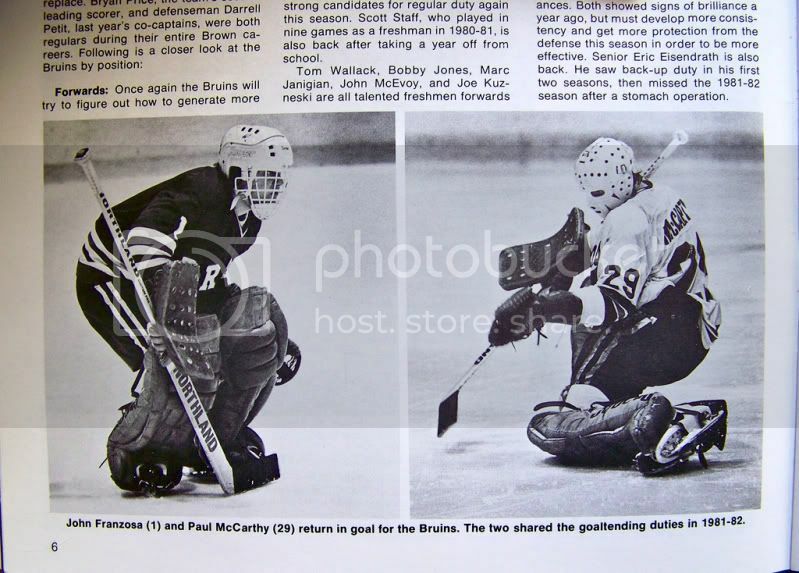 Scott Borek and Dan O'Brien, Dartmouth, 1980s. As you can see in the two photos, both Borek and O'Brien are wearing neckrolls, similar to what you see linemen wearing in football. Borek suffered a scary neck injury, and wasn't the same afterwards. He did, however, wear the neckroll for added protection. 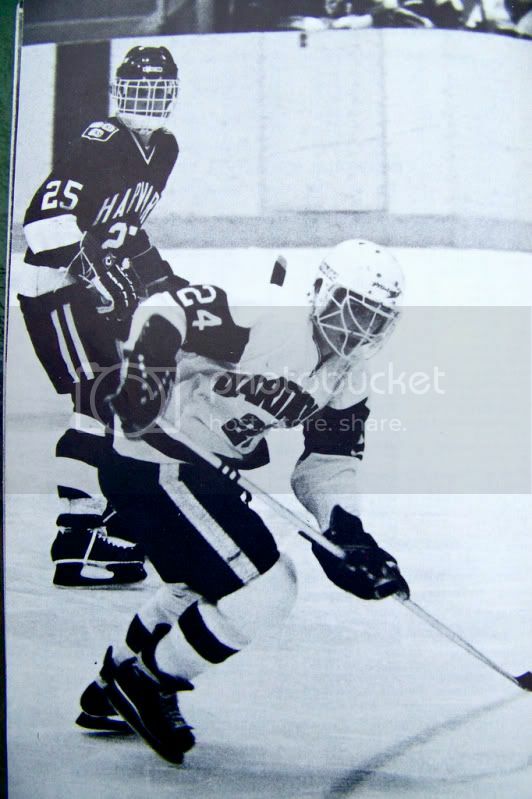 Dartmouth-Harvard, 1980s. Here is a clear picture of the two styles of cages worn by players at that time. I'm not big on the ProTec cage after seeing it over and over. 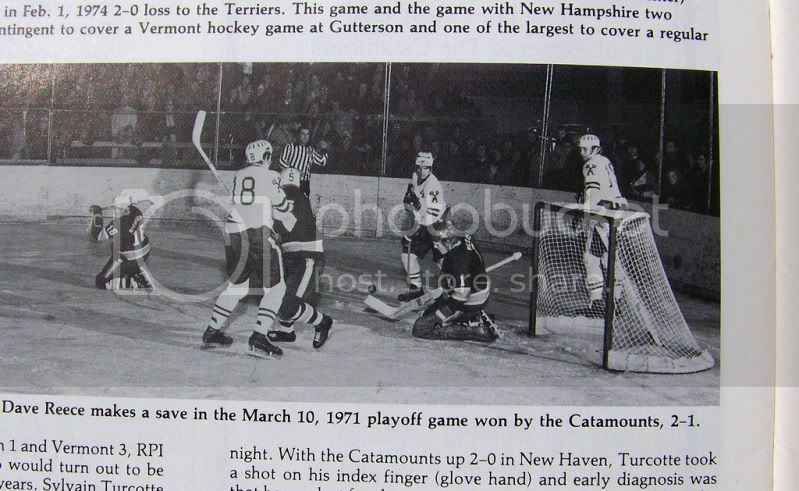 Then again, I always wore a cage similar to the Harvard player when I played. Dartmouth University, 1985. 1985 saw Itech get involved in making lightweight, plastic face shields for players. Honestly, shields are worn by a large number of NCAA players now, but I never wore one because I found it fogged up way too much. To each, their own, I suppose. First off, a huge thanks to triswykes for sending me this gallery. This is just a small example of some of the photos he sent, and I really can't thank him enough for this effort. There are some really cool pictures in there, and I'm glad to have seen them. Updates for this week include another entry in Teebz's Book Club, and a look back at a historical period of time as I break off the playoff chase for a few days. The HBIC Playoff Pool is updated, and last year's winner - Justin St. Louis - is currently leading the pack again. For those at the bottom, you're not out yet! Alexander Ovechkin is a one-in-a-million player. I can't deny how good he is when the puck is on his stick. I'm still not a fan of over-the-top celebrations like the "hot stick" routine he pulled when he scored his 50th goal this season, but the guy is a magician with the puck. He celebrates his teammates' goals as much as he celebrates his own, and it's phenomenal to see someone love the game as much as he does. And tonight, against the New York Rangers in Game Five of their opening round series, Alexander Ovechkin added another highlight to the legend. This is, without any doubt whatsoever, the goal of the playoffs thus far. And it will probably be the goal of the 2009 NHL Stanley Cup Playoffs after all is said and done. Hold on to your butts, people. This one is a beauty. Derek Morris? Pylon. Thanks for coming out. After all the goals he has scored, that has to be one of the best. With it being in the playoffs and how he literally breezed past Morris, that is a thing of beauty. The key in this whole thing? It's almost as if there is an "Ovechkin Curse" on defenceman Paul Mara. Mara is a defenceman for the New York Rangers, and if you watch the video closely above, you can see #27 on the ice. However, Mara has been involved in another highlight reel goal from Alexander The Great as well. #23 on the Coyotes? Paul Mara. Sorry to Mr. Mara for bringing up those demons, but Ovechkin and Mara are forever a part of goal-scoring history now. This despite Mara's obvious attempts not to be included. I'm not a Capitals fan by any means, but it's hard not to be in awe of Alexander Ovechkin. Especially after seeing goals like that. Well, we've seen the brooms come out in the Western Conference twice, and both times saw inexperienced teams take the fall in series. The Vancouver Canucks sent a very young St. Louis Blues team home with their tail between their legs, while the Detroit Red Wings played the role of teacher against the Columbus Blue Jackets in their series. Really, though, the two series couldn't have been any different as the Vancouver Canucks relied on a goaltender who is world-class and in a zone all by himself. The Detroit Red Wings, on the other hand, proved to be the "Big Red Machine" we're all used to seeing as they got scoring from everywhere and simply rolled over the Blue Jackets without much resistance. Over in the Eastern Conference, the Montreal Canadiens were swept out of the playoffs with ease by the Boston Bruins. Montreal looked like a team defeated before Game Four even began, and the bigger, faster Bruins simply pounded them into submission. While Montreal has a number of playoff-experienced players, the Eastern Conference sweep was much different than the Western Conference sweeps in that Boston was just a much better team than the Montreal Canadiens were in all facets of the game. The Blues, in my eyes, don't really need to do much to change their playoff aspirations for next season. They have a great young nucleus of players mixed with some savvy veteran players, and their goaltending is fairly decent. Chris Mason doesn't have the résumé of a Roberto Luongo or Martin Brodeur yet, but he doesn't have to be a world-beater with this great group of youngsters in front of him. Like Detroit with Osgood, all Mason has to do is make the routine stops, and the Blues shouldn't have a problem returning to the playoffs next season. There is nothing that can teach experience like experience, and having the Blues' youngsters experience this run to the playoffs should make them a tougher team next year. Getting a healthy Paul Kariya back will help as his experience can't be overlooked, and his leadership is something that St. Louis could have used this April. All in all, I see St. Louis being a threat in the Western Conference next season if they play as well as they did in the second half of this season. And there is nothing to suggest that they cannot. Will they make the playoffs? I'd say there's a pretty good chance that they'll be back next season. The Columbus Blue Jackets need a few pieces to make a deeper run next season. First, they need a solid, puck-moving defenceman to get their speedy wingers the puck. Kris Russell is coming along, but he doesn't have a world-class outlet pass yet, and it really showed against the Detroit Red Wings. When Nash, Huselius, and Modin can't get the puck up ice, the Blue Jackets tend to play in their end far too often. Having someone who can stretch the ice like a Lidstrom or a Rafalski would really help the Blue Jackets' cause. Secondly, the Jackets have to find a centerman for Rick Nash. RJ Umberger showed he is a very capable centerman as he was the Jackets' best player in the series, but Umberger is a power forward, not a setup man. Rick Nash needs a slick skating man in the middle to help him take command of a game. Do I see Columbus in the playoffs next season? With Derrick Brassard, Nikita Filatov, and Jakub Voracek headlining this roster that features 15 skaters who are 25 years of age or younger, the Blue Jackets will only get better, and this taste of the playoffs combined with the spanking laid on them by the powerhouse Red Wings should have the intensity and fire burning deep within their bellies. Will they be back? My guess is yes. And then we come to the paradox that is the Montreal Canadiens. Soundly beaten by their arch-rivals in the Bruins, the Canadiens are a team in disarray. And as sad as this may sound, I don't think they will be as good as they were this year when the playoffs roll around next season. Fourteen unrestricted free agents including key cogs such as captain Saku Koivu, winger Alexei Kovalev, and defenceman Mike Komisarek will be tough to sign. Who do you let go if you're GM Bob Gainey? Do you bring in a new coach or do you remain behind the bench? If you do bring a new coach, do you bring in a taskmaster like John Tortorella or someone who relies on a system where everyone buys in to win like a Pat Quinn? These questions should hopefully be answered by next September, but I don't see Montreal cracking the eight spots in 2010. They were horrible down the stretch this season, and backed into the playoffs with four straight losses. Sadly, this team needs a lot of re-tooling, and it might be a "rebuilding year" next season for Les Habitants. Now, I'm not one to make bold predictions, and a lot will happen between now and next April. However, if everything stays the same, the two teams in the West seem to be going up while the Eastern team seems to be on a serious down-swing. Your thoughts? Hit me with them in the comments. I spent a long day in a room like this as I was responsible for setting up and taking down all of the electronic equipment used for the meeting. It's part of my job, and I really can't complain about that, but spending thirteen hours at work today just isn't my idea of fun. I miss a gorgeous evening of sunny weather, I missed two hockey games, and I missed the majority of the third game tonight. Heck, I missed the Montreal Canadiens being taken out to the woodshed again by the Bruins as the Bruins ended their series with an exclamation point. So much for the 100th season party with the Stanley Cup. Basically, what I'm saying is that I'm tired, and I really have no energy to write and/or think. What did make me laugh are some commercials. Yeah, I'm a little late on these, but these commercials for the Bruins are, in a word, priceless. Enjoy! Hilarious! Could you imagine if every team did something like this? Kudos to the Bruins for these commercials. Highly entertaining! Well, the St. Louis Blues came to the party, but it seems they were uninvited as the Vancouver Canucks ousted the upstart Blues in a four-game sweep. Tonight's game was a 3-2 victory in overtime that saw Alex Burrows score with 19 seconds remaining in the first overtime period to seal St. Louis' fate as the first team eliminated from the 2009 NHL Stanley Cup Playoffs. It's interesting to think that there have been some pretty big moments in overtime over the course of NHL history. 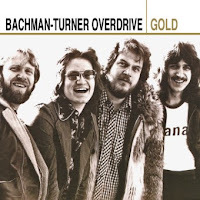 This one, while big in Vancouver's history, probably won't make any major lists of overtime achievements, but there have been a number of overtime games where players literally were "workin' overtime". With the playoffs well underway, here are some of the more memorable overtime games that I remember. The longest game in modern NHL history took place in Pittsburgh. The visiting Philadelphia Flyers and Penguins were tied at one goal apiece, and into their fifth period of overtime. The 2000 NHL Playoffs changed dramatically for the Penguins after Keith Primeau ripped a shot past defenceman Darius Kasparaitis and goaltender Ron Tugnutt after playing 92:01 of extra time. Pittsburgh had won the first two games of the Eastern Conference Semi-Final, and led the series 2-1 until Primeau scored. That tied the series, but the Penguins were never the same as they went on to lose the next two games as well. 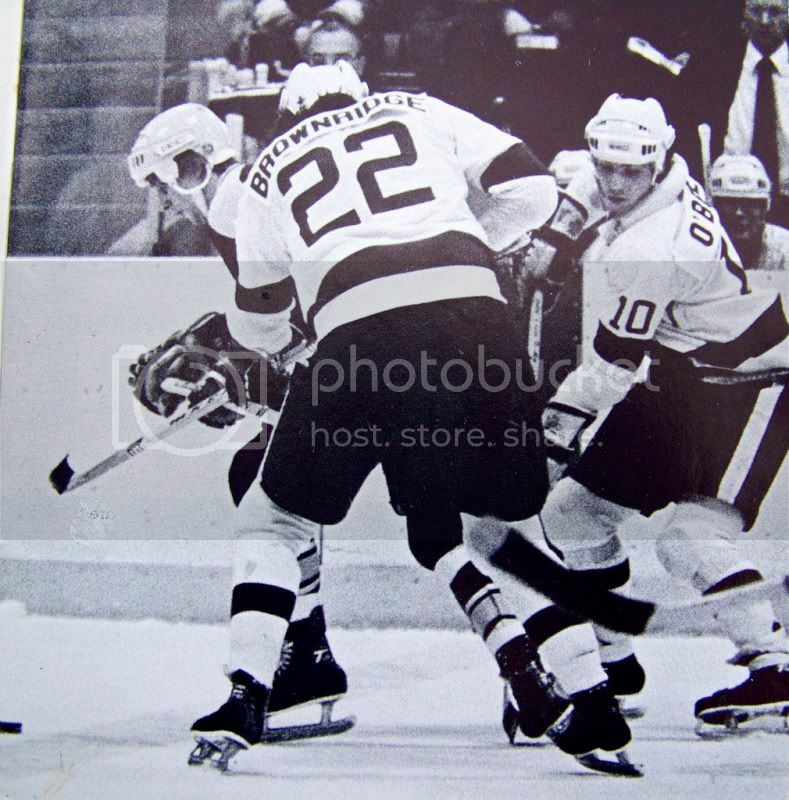 This game is the third-longest in NHL history, and I remember watching every second of it. Here's the video of Primeau's historic goal. 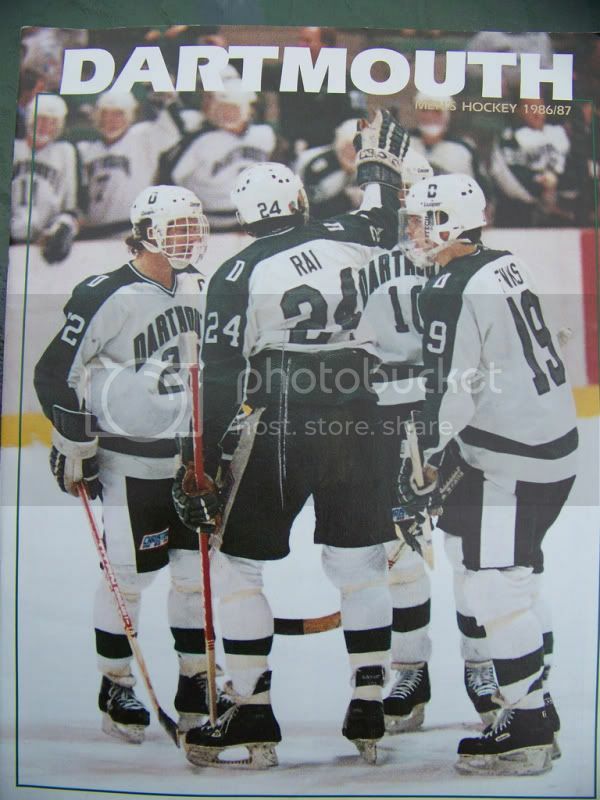 Pat Lafontaine's overtime goal will always be remembered as my first experience with multiple overtime periods. We go back to April 18, 1987 for this one. The Washington Capitals and New York Islanders are tied at 2-2, and pushing into early morning. By the fourth overtime period, both teams looked exhausted. The key on this goal? The Islanders eliminated the Washington Capitals on Lafontaine's slapshot that got past Bob Mason after playing 68:47 of additional time. This is officially the tenth-longest game in NHL Playoff history. Let's take a look at this one. Another one that I remember staying up and watching until the wee hours of the morning was the 1996 battle between the Pittsburgh Penguins and Washington Capitals. Washington had won the first two games on Pittsburgh's ice, and the Penguins had won Game Three on Washington's ice. The fourth game would prove pivotal. Petr Nedved's fake shot froze goaltender Olaf Kolzig enough, and his wrist shot found its way through a crowd at the 79:15 mark of extra time. This is officially the fifth-longest game in NHL history. Here's Nedved's overtime winner that tied the series, and pushed the Penguins to a 4-2 series win. Now, I'm not saying that every team that has played in a long overtime game and lost has gone on to lose the entire series. However, history shows us that this case more often than not. Overtime, especially a game that goes twice as long as a regular game, is especially grueling on a player's body, and this apparently has a major effect on the losing team. It's like adding insult to injury. Pittsburgh-Philadelphia in 2000. Philly wins Game Four after 92:01 of overtime, and goes on to win the series 4-2. Anaheim-Dallas in 2003. Anaheim wins Game One after 80:48 of overtime, and goes on to win the series 4-2. Pittsburgh-Washington in 1996. Pittsburgh wins Game Four after 79:15 of overtime, and goes on to win the series 4-2. Vancouver-Dallas in 2007. Vancouver wins Game One after 78:06 of overtime, and goes on to win the series 4-3. Dallas-San Jose in 2008. Dallas wins Game Six after 69:03 of overtime, and wins the series 4-2. Washington-NY Islanders in 1987. New York wins Game Seven after 68:47 of overtime, and wins the series 4-3. In all of those series, the team that won the extended overtime game has gone on to win the series. Not only are players on the losing team physically drained, but they are drained emotionally and mentally as well. In a seven-game series, that kind of mental and physical fatigue can really affect a team... as history shows. An overtime win is a far bigger factor than we may give it credit. Playing early into the morning can generally change a series, so while it may be entirely true when coaches tell their teams that they would prefer to win early, history says playing more than an hour of overtime and winning has a far bigger effect than playing for, say, ten minutes of extended time. Of course, keeping people and players awake and energetic becomes a problem at that point. Congratulations to the Vancouver Canucks, the first team to advance to the second round of this year's NHL Stanley Cup Playoffs! I'll be honest here. Sean Avery has done a good job in pushing the Washington Capitals to the brink of their sanity in the first two games. He has been in the faces of Mike Green and Jose Theodore. He has hit Alexander Semin and Alexander Ovechkin. He has trash-talked and yapped at the entire Capitals bench. Head coach John Tortorella has Avery playing inspired hockey, and his renaissance on Broadway has been a feel-good story after all the crap that he pulled earlier this season. He is playing the game within the rules, his chatter with reporters is clean but fun, and his teammates seem to enjoy having him around. Which leads me to Game Three tonight. Sean Avery was in Simeon Varlamov's face all night. He was trash-talking the young goaltender every chance he got, and parked himself at the top of the crease all night. Every chance he had, Avery was yapping in Varlamov's grill. Which is strange since Varlamov doesn't understand a word of English. Did Avery learn Russian in two days? Otherwise, why is he yapping at a player who doesn't comprehend anything he is saying, and what is he trying to accomplish? Intimidation is one thing, but trash-talking a guy who will give you nothing but a blank stare is pointless. Then again, it is Sean Avery. Need anything else be said? It's Sunday, and there is a ton of NHL Playoff action on the CBC today, so I really don't want to devote a lot of time away from the tube. 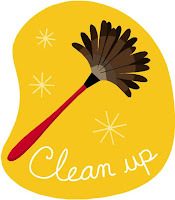 However, being that it officially feels like spring now, it's time for HBIC to do some cleaning. What feels like an eternity of winter has moved on to more northern pastures as the warm weather moves in, and that means I need to delete and change some stuff. Firstly, I'll be going through the blogs to the right and deleting those that have not been updated in some time. I want current info from the blogs that I read, not something from December. Secondly, I'll be adding a few blogs and websites in that I really have found useful lately. Lastly, I'll point out a few things about the playoff pool as well. Get out the brooms! There have been some blogs who have moved, and these blogs need mentioning. 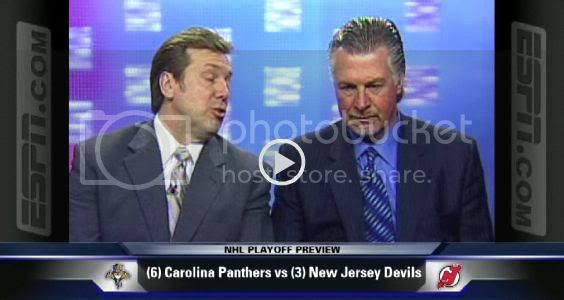 The always-entertaining Barry Melrose Rocks is now part of the Bloguin network. Schultz, Henning, McBrayer, and Loser Domi do a fabulous job at bringing you the hockey news with a large slice of comedy. Well worth the read at their fabulous new digs. Cassie may have left Bolts Blog, but the people at Raw Charge should be happy about getting her contributions. Cassie is a talented writer, and Raw Charge will benefit from her addition as the SB Nation team gets a little stronger. I want to add Stephanie's and snoopyjode's awesome site called Roaming Penguins. I linked to this blog before, but I'm officially adding it to the list over there. They have a fun site, and I really am impressed with their charitable donations through their hard work. Blitz Corner is also being added to the list. I've read through their stuff, and it's not bad at all. While I'm not a fan of their layout per se, I do appreciate the good articles, so they'll get bumped to "the list". So who is gone? The list is longer than who has been added. Colin Timberlake? Cut. Sorry, but no updates since February. Faceoff Circle? Gone. Once a week isn't that hard, is it? Leahy had indicated in January that he was leaving Going Five Hole, but I held out hope. To no avail. Gone. He Score, He Shoot? Loved the work, but February is a long way back. Axed. Hershey Bears Blog? Doesn't even exist anymore. Gonzo. Hockey Guy? Love your work, Ben Lovejoy, but need more than December's last entry. Done like dinner. My Tribe? Let me know if you ever get back. Until then, you're eating up space. NHL 2K9? If you ask me for a link, please update more than monthly. Clean out your desk, though. You're done. Scoring For Houston? Nothing submitted since the end of February. Just not good enough. Set Out Your Staal? This isn't a timeshare. I'm offering your spot to someone else. Sledge Hockey Dad? As informative as your site is, there's been no update since the start of the NHL season. Untypical Girls? Loved your work. Hate the fact that there is no update since Christmas. Lastly, the playoff pool is rolling along. I try to update the previous day's games by the next day, but sometimes I'm busy. Don't worry, however. I will update everything whenever I log in to this site. And if you're worried about your point total, there is still a lot of hockey to be played. No one gets eliminated until the Stanley Cup is awarded. I'm back to hockey. Philly leads Pittsburgh 2-0, so I need to get my rear back to the couch. Today's afternoon game is a rematch from Thursday's afternoon game where Finland met Canada. Canada, on its 4-0 record, is the designated home team, and has come out in their white uniforms. Finland takes to the ice in their blue uniforms and will look to rebound from the 8-3 hammering Canada put on them on Thursday. The largely pro-Canadian crowd is once again decked out in their red-and-white gear, and the 500 or so people really are cheering the Canadians as they take to the ice for the pre-game skate. As a roster note, #11 Jason Plumb of the Canadians will not be playing in today's game due to receiving a second game misconduct in Thursday's game. His physical presence will be missed, but Canada needs to play disciplined to win today. We're moments away from the drop of the puck, so here are your gold medal game highlights! Canada has come thundering out of the gates here as #12 Chris Garbacz throws two bone-rattling hits on Finnish players. Canada is really asserting themselves in the physical aspect of the game in the early going. Janne Yrjola gives the Finns the lead at 16:37 with a powerplay marker. Goaltender Ryan Armitage flopped to his belly to cover the puck, but it was poked loose. Yrjola found the loose puck just outside the crease and flipped it over the sprawled Armitage. Finland leads 1-0. Canada just has taken two unnecessary penalties. The first, to #12 Chris Garbacz, for goalie interference eliminates a Canadian powerplay. The second, 30 seconds later to #19 Mike Merriman for tripping, puts the Finns on a five-on-three powerplay for 59 seconds. As I stated above, Canada needs to play disciplined or the Finns will win this game. With 11:20 remaining, Canada has killed off the goalie interference penalty. Finland still has 24 seconds remaining in their man-advantage. Some extreme confusion between the benches as #7 Marko Liimatainen was sent off for ten minutes. Canada thought they were on the powerplay, but all was clarified by the officials. Seven minutes remain in the first period. With 6:27 to play, #26 Elias Nurminen found himself all alone in the slot. His high snapshot from the hash marks was turned aside by Ryan Armitage's left shoulder to keep the Canadians down by only one goal. With 3:40 remaining, both teams have turned up the dial in the hitting department by a few notches. The Finns have caught the Canadians a couple of times against the boards hard, while Canada has responded with some crunches on the endboards. #19 Mike Merriman takes a swipe at a covered puck by #1 Pauli Kitula, and that brings a scrum into the crease. #13 Fredrik Oller gives Merriman the business, but only Merriman goes to the box for slashing. 1:42 remains in the first period. With 30.1 seconds left, a Finnish player is down on the ice behind the play, and he looks to be in considerable pain as he favors his left leg. At the end of a fast-paced, hard-hitting first period, Finland leads Canada by a 1-0 score. Honestly, this has been the best first period of action seen thus far by this writer, and I am thoroughly impressed with both teams' intensity and passion in this game. Canada needs to start playing more disciplined, however, if it wants to pull even with the fiesty Finns. On to the second period! At 17:37 of the second, #7 Steve Devine was ejected for throwing a punch while on the bench. He also gets a two minute penalty for unsportsmanlike conduct, and a ten-minute misconduct for his actions. The Finns go back to another powerplay. At 16:45, #14 Cole Pearson was whistled for a high-stick. The Finns will have their second five-on-three advantage for just over a minute. At 15:55, a shorthanded breakaway for #8 Davin Bell during the five-on-three from his own blueline is turned away by Kitula's blocker. Canada misses a glorious opportunity. At 15:28, #12 Chris Garbacz is sent in alone shorthanded from the Finnish blueline. Kitula gets just enough of it with his glove to knock it down, and it still finds its way behind him only to hit the post before he covers it. Canada is getting good chances now as they seem to more frustrated with the officiating than the Finnish team. #8 Davin Bell is sent off at 13:41 for throwing a hit on Finnish goaltender Pauli Kitula. Two minutes for goaltender interference has to be called on that, and it is. #13 Fredrik Oller is whisted for interference for running a pick on Canadian forward #29 Brett McLaren. McLaren could have easily won that footrace to the loose puck, so that may have been a smart play by Oller. Canada's #6 Brad Gurr and Finland's #7 Marko Liimatainen are sent off for coincidental minors at 10:43. Gurr was whistled for holding, and Liimatainen was whistled for the dive. #14 Cole Pearson is sent off at 9:33 for a hit to the head. That'll be two and ten for the elbow to the head. With 9:00 remaining, this game is beginning to turn into a parade to the penalty box for Canada. #8 Davin Bell is called for kneeing, and skates directly to the box. Five seconds into the powerplay, #22 Jan-Erik Granvik rips a shot from the high slot for Finland's second powerplay goal of the game. Finland leads 2-0. Right after the goal, Canada is whistled for holding as #15 Dawson Friesen joins his teammates in the sin bin. Finland is turning this into the powerplay show. Janne Nyberg rips a slapshot to the high glove corner to put Finland up by three goals. Finland leads 3-0. #3 Jalen Harris and #20 Kimmo Hoivassilta are sent off together at 6:46. Harris goes for holding, and Hoivassilta for diving. Finland's #11 Tero Tiainen is sent off for hooking, and Canada will go on the powerplay with 6:05 remaining in the second period. Now would be a great time for Canada to start the comeback. With 2:58 to go, #25 Scott Savard is sent off for roughing. Canada's lack of discipline in this game - seriously, keep both hands on the stick and the lumber on the ice! - is costing them this game. Less than a minute later, and penalty boxes are full for coincidental minor penalties. Referee Brett Montsion is really hearing it from the fans as even the smallest of infractions are being called. With 1:12 to go, Montsion receives a huge ovation as Finland's #20 Kimmo Hoivassilta is sent off for holding. Montsion has his head on a swivel now, looking for anything that resembles a penalty. After a penalty-filled second period, Finland has the advantage, and the gold medal in their sights, as they lead 3-0. Goaltender Pauli Kitula hasn't been shaken by any of the scrums taking in and around his crease, and looks solid through two periods of play. If Canada wants to win this game, they need to start moving their feet at all times. Referee Brett Montsion has taken this game over, and the only way they are going to win is by out-skating the Finns. The last period of the tournament starts shortly! #4 Janne Nyberg begins the parade back to the box as he's called for high-sticking at 18:21. Canada needs this powerplay goal desperately. Finland is back to even-strength. Canada needs to keep the pressure on. Janne Yrjola rips a wrist shot on a partial breakaway wide, but regains control and centers it for #19 Eetu Keski-Levijoki who taps it home through Armitage's five-hole. Finland leads 4-0. Canada has 15:00 remaining in their quest for gold. And it doesn't look promising. Finland is playing classic trap hockey, and you can see the frustration building on the Canadian side. On a two-on-one, #24 Janne Yrjola cruises down the left wing and draws defenceman Casey O'Brien towards him before saucering a pass across to #19 Eetu Keski-Levijoki. Keski-Levijoti makes no mistake and fires it into the yawning cage at 14:49. Finland leads 5-0. With 8:52 left, time is staring the Canadian squad down. They have to find a way through the suffocating Finnish collapsing defensive unit, or this game is over. With 8:06 remaining, Canada has a deflected goal disallowed as #14 Cole Pearson is called for goaltender interference. The crowd is all over referee Montsion after that call. Kitula flops, and the referee reacts. With 5:55 remaining, #4 Janne Nyberg is lying on the ice. Why? No clue. He didn't get hit nor was he hit with the puck. Canada is finally legally on the board! With 5:50 left, Casey O'Brien lasers a shot into the Finnish net, providing Canada with some sort of hope. Father Time may have something to say about that, though. Finland leads 5-1. And as soon as Canada has some momentum going, they take another penalty as Montsion calls Casey O'Brien for roughing with 5:37 left. Slim and none are all the chances that Canada has left. Canada is giving it all they have. With 3:58 remaining, Canada nets their second goal as #15 Dawson Friesen slaps home a rebound between Kitula's pads. Finland leads 5-2. With 1:50 remaining, Canada will need some sort of divine intervention at this point, but they are generating a number of chances. Kitula, however, is equal to the task. With 1:14 left in the game, Finland's #24 Janne Yrjola is sent to the box. Too little, too late for Canada at this point in the game, however. With the final horn, the Finnish players rush onto the ice to mob their goaltender in traditional fashion. Canada's undisciplined play in the second period is certainly the story of this game as Finland took advantage of the tired Canadian penalty killers. Finland will be crowned as the first-ever World Deaf Ice Hockey Champions momentarily, but we still have Player of the Game to complete. It should be no surprise that Pauli Kitula will probably be a tournament all-star at minimum as he really carried his team this afternoon. Player Of The Game - Canada: #25 Scott Savard. Player Of The Game - Finland: #1 Pauli Kitula. Tournament's Best Goaltender: #1 Pauli Kitula (Finland). Tournament's Best Defenceman: #19 Mike Merriman (Canada). Tournament's Best Forward: #24 Janne Yrjola (Finland). Tournament MVP: #1 Pauli Kitula (Finland). As the speeches from the various VIPs are made, I want to say that these games were some of the best hockey I have seen in a long time. While it doesn't compare to the Olympics or the NHL, the entire tournament was a phenomenal showing of athletic abilities from the deaf community, and both the hockey players and curlers showed their abilities with pride on the international stage. Once again, I cannot say thank you enough to the organizers of the World Deaf Ice Hockey and Curling Championships. Everyone who I spoke to this week went out of their way to assist me in whatever way necessary, and it's that kind of hospitality that makes one remember an event like this for a long, long time. To my colleague Steve Perreira, you were more than outgoing this week, and your assistance in getting me up to speed with rosters and teams was outstanding, and I can't thank you enough. I may have bought you lunch on Saturday, but you gave me a lifetime of memories and a week's worth of laughter. Thank you for everything you did. You were my go-to guy for all I needed. Thank you! To Denise Watson, in charge of Public Relations, I thank you for allowing me to attend the games and to learn about the deaf community in so many ways. Without your support, I may never have had the chance to experience this event, and I cannot thank you enough for including me - a hearing person - to be part of the First World Deaf Ice Hockey Championships. Thank you! Congratulations to Team Finland on their gold medal victory! Congratulations to Canada on their silver-medal performance! Congratulations to Team USA for their bronze medal win! And to both Russia and Slovakia, congratulations on a great week of hockey, and good luck at the Deaf Olympics in Slovakia to all the teams! Unlike Thursday night's affair between the Russians and Americans, the rematch today has more on the line than just home-ice advantage. The Russians and Americans square off for the first bronze medal ever awarded at the World Deaf Hockey Championships, so there is a some very distinct history being made in Winnipeg today. The action shifts to the MTS Centre, home of the Manitoba Moose. If you have been reading about the World Deaf Hockey Championships, I want to thank you on behalf of both myself and the organizers of this event for your continued interest in the games themselves. The athletes, from what I can tell, have enjoyed the games, and the entire deaf community is, in a word, a family. They have really put on an excellent event, and today's medal games is the culmination of a lot of hard work and dedication by both the organizers and players. 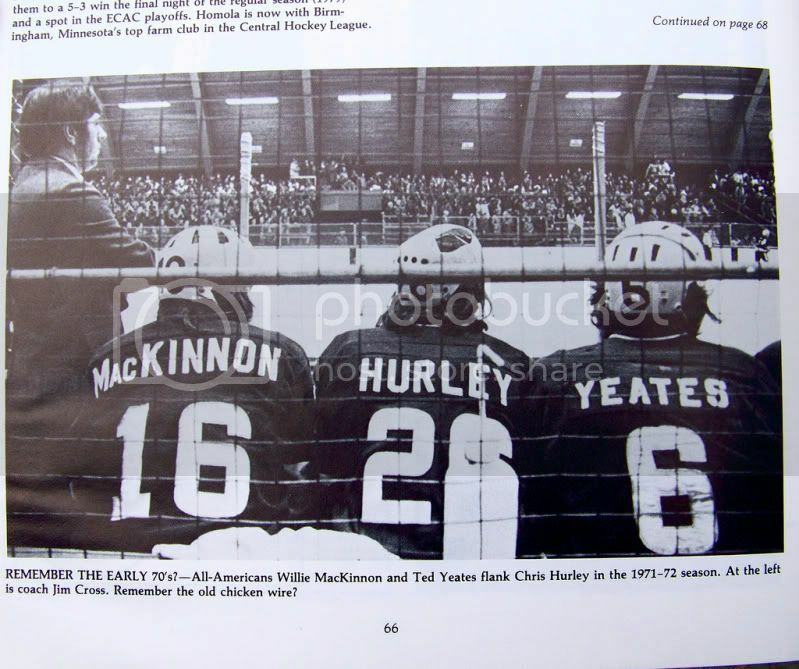 Hockey Blog In Canada is proud to have been a part of the inuagural World Deaf Ice Hockey Championships, and look forward all other events in the community! As you may have seen Thursday, Team USA defeated the Russian squad by an 11-1 score. The Americans used their forecheck and puck movement skills to outscore their opponents. However, Russia's passive play changed with about six minutes to play, and they really turned the heat on the Americans. About 75 people are on-hand for this game, but the pro-American crowd appears very enthusiastic. Team USA is in white after finishing the round-robin at 2-2, and the Russians will be the visitors after they finished 1-3. We're moments from the first whistle, so let's get to the action! Russia already looks like a different team. They are skating harder and using their individual skill to control the puck for shots. After a minute and a half, this game doesn't come close to resembling the effort on Thursday. With 17:53 remaining, we have our first penalty called. #5 Vyacheslav Kazantsev of Russia is sent off for tripping. The Americans show excellent puck movement and control on the powerplay as they pin the Russian penalty killing unit in their zone for 1:20. The Russians need to end the stickwork. #17 Aleksey Baburkin is sent off for a trip as well, giving the Americans 20 seconds of five-on-three hockey. The Russians need to move their feet rather than using their lumber to slow the American players. With 14:15 to play in the first, goaltender #30 Anatoliy Potapov really looks sharp. He has made a number of saves with traffic in front of the net, and one outstanding glove save already. #9 Roman Chernov rings one off the post behind American goaltender David Rancourt with 13:50 to play. The Russians definitely have more aggression in their game today. A thunderous hit behind the Russian net by American #10 Casey Riffle calls for a stoppage in play with 12:24 remaining as the Russian defender is down on the ice. It appears that #17 Aleksey Baburkin is ok as he gets up slowly. With 9:06 remaining, the Americans will go back to the powerplay as #18 Viktor Deriglazov is sent off for hooking. The Americans are using their speed effectively to force the Russians to take lazy penalties. On the powerplay, the Americans strike! With 7:50 remaining, #19 Andy Howard strips a Russian of the puck along the halfboards, and stickhandles his way from the left faceoff circle to the right faceoff circle, causing Potapov to go down early. 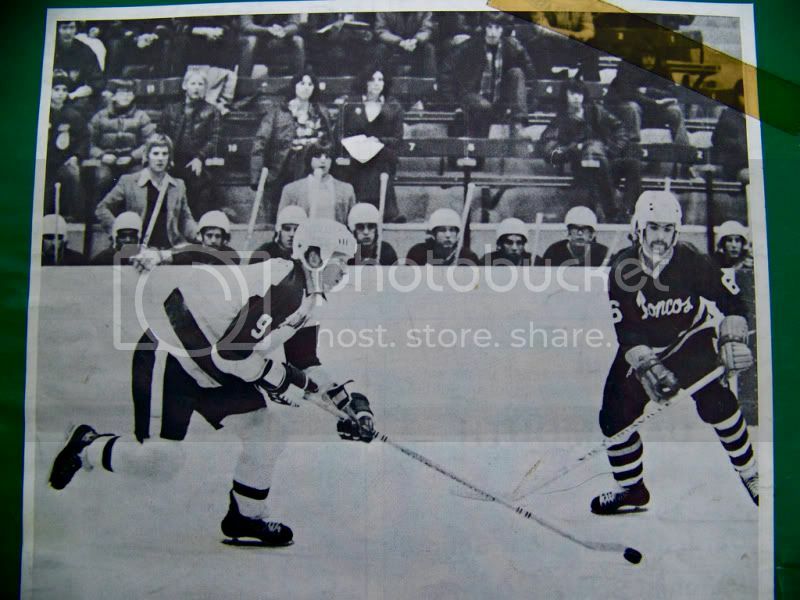 From the right hash marks and using a Russian defender as a screen, Howard roofs the puck for the game's opening goal. USA leads 1-0. #18 Viktor Deriglazov is making himself a home in the penalty box. With 5:27 to play, he is sent off for tripping. And with Deriglazov off, the Americans notch their second powerplay marker with 5:18 left! The Russian team, in particular goaltender Anatoliy Potapov, are unhappy with the goal. There is a conference at their bench with the referee and linesman, but to no avail. #12 Jon Weintraub gets credit for the goal. USA leads 2-0. With 1:43 remaining, #18 David Reid scores a gorgeous goal. Skating in on the left hash marks, Reid fires a rising wrist shot through a Russian defender's legs and over the glove of Potapov. USA leads 3-0. At the end of the first period, USA has a commanding 3-0 lead. It very well could be a six- or seven-goal lead had it not been for some brilliant goaltending by Anatoliy Potapov. To me, it seems the Russians are playing hard for short periods of time, but they get lazy in their own zone which results in penalties. Both of Deriglazov's penalties were the result of him not skating with the American player. The Russians need to match the American team's footwork, or this could be another American blowout like we saw on Thursday. Potapov makes a terrible mistake at the 16:49 mark of the second. On a dump-in directly on net by #10 Casey Riffle, Potapov kicks out a huge rebound. The streaking #15 Miles Gates cuts in hard off the left wing and puts the rebound in the net. USA leads 4-0. With 14:03 to play, the Russian powerplay gets little going. They don't dump-and-chase, and they aren't strong enough on the puck to carry it through the American defenders. Russia needs to change their gameplan if they have any hope of a comeback in this game. #9 Peter Gentoli is sent sprawling in front of the Russian net while shorthanded. That kills the Russian powerplay with 12:08 to play in the second as #15 Sergey Kargin is sent off for interference. In what has to be the dumbest play yet by the Russians, #5 Vyacheslav Kazantsev is sent off for slashing with eight minutes to play. When your team has the puck and is clearing the zone, taking a selfish, stupid penalty in front of your own net should get you a permanent seat on the bench. Potapov stops #9 Peter Gentoli on a breakaway with his right shoulder. As I stated above, this game would be over if it weren't for Potapov's efforts. He has been outstanding in the Russian net. With 6:07 remaining, Russia has been assessed a four-minute double-minor penalty for spearing and a ten-minute misconduct. Again, another stupid penalty by #17 Aleksey Baburkin. Selfish and unnecessary. The first minor penalty is over quickly when the Americans score with 5:39 remaining. #18 David Reid taps in a rebound from the left side of the crease to add to the American lead. USA leads 5-0. And the second minor penalty is done 59 seconds later. With 4:40 remaining, the Americans strike again. This time, #11 Brian Van Vlyman rips a blocker-side wrist shot past Potapov with Casey Riffle providing the screen. That's the fourth American goal with the man advantage. USA leads 6-0. The story of this game, quite frankly, is discipline. Anatoliy Potapov has done everything humanly possible to keep the Russians in the running for the bronze medal, but four powerplay goals by the Americans have put this game out of reach. David Rancourt hasn't seen much action in the American net - another sign of the passive gameplan that the Russians are using. Combine that with the aggressive American attack, and the only thing left to decide is the final score. The US is outshooting the Russians by a 44-12 margin. 30 seconds into the third period, and #12 Jon Weintraub is crushed into the boards by a Russian. He comes up clutching his arm and elbow, and heads straight to the bench. That didn't look good. Hopefully, he's ok.
#22 Jon Dickson rips a shot past Potapov to add to the American lead. The rout is on as the Americans don't seem to be letting up. USA leads 7-0. #4 Evgeniy Zabelin appears to take a hit from behind in the left corner of his own zone with 17:45 remaining. After the trainers help him off the ice, he beelines for the US bench and takes a swing at an American player. The linemen and referee jump in to restore order, but Zabelin's tantrum continues as he is sent to the penalty box for ten minutes to think about his actions. #22 Jon Dickson was assessed a ten-minute for the check from behind. The Americans tack on another goal at 17:32. #9 Peter Gentoli fires home a shorthanded goal. USA leads 8-0. After the goal, the Russians pull Popatov and #1 Iskander Latypov takes over in net. 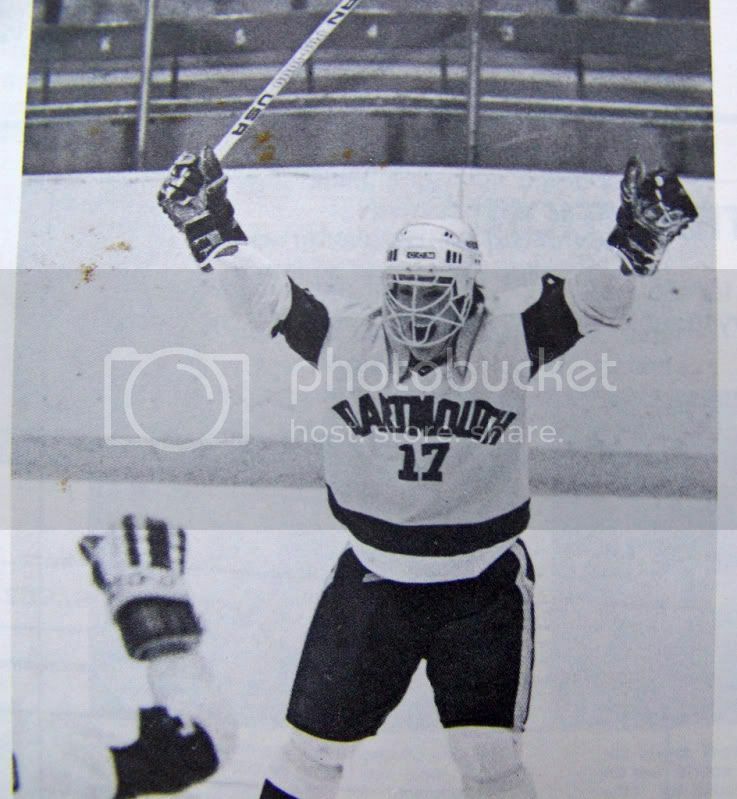 At the 14:10 mark, David Rancourt can take a well-deserved seat on the bench as Joe Lingle skates into the crease. With 14:06 to go, the Americans notch another goal. #15 Miles Gates builds a bigger lead for the US squad. USA leads 9-0. The game is now getting dirty. #21 Konstantin Bobov is whisted for roughing with 12:08 remaining as he hits an American player, and then drives him into the ice. With 8:40 to go, #15 Sergey Kargin is sent in all alone on Lingle. And rings it off the post on the blocker side. With 6:12 remaining, an American goal is waved off after Latypov has some new creasemates. The Americans stage a slight argument, but don't press the issue aside from asking for an explanation. With 4:51 to play, the Americans hit double-digits. #8 Mike Wonoski picks up the tenth goal for the US squad. USA leads 10-0. With 3:58 remaining, #17 Aleksey Baburkin throws a vicious crosscheck to the head of American #18 David Reid. Reid responds with a two-hand slash to the shin pads, and the Russian goes after the smaller American. After being grabbed by the linesman, Baburkin is given a ten-minute misconduct and four minutes for crosschecking and roughing. Reid is assessed two for slashing. When it rains, it pours. After winning the faceoff, Russian defender #5 Vyacheslav Kazantsev turns to clear the puck without looking and fires it past Latypov. #9 Peter Gentoli is credited with the goal at 3:09 of the third. USA leads 11-0. With 1:17 left, the Russians are completely out of this game mentally. #17 Robert Ruef is sent in on the breakaway, and Russian forward #10 Oleg Danilenko hooks him to the ice. #7 looks like he'd be more at home in the NHL All-Star Game Shootout Competition as a he jukes and jives, performing more starts and stops than a figure skater. Needless to say, the penalty shot was waved off. At the final buzzer, the American team has defeated the Russians by an 11-0 score, giving them the bronze medals in the process. The Americans legitimately got better as the tournament progressed, adopting more hard work as the answer to their goal-scoring problems from the first couple of games. With that new ideal, the Americans handily beat the Russians twice and the Slovaks. Player Of The Game - Russia: #10 Oleg Danilekno. Player Of The Game - USA: #19 Andy Howard. In the spirit of sportsmanship, both teams shook hands and really seemed to congratulate one another. Pictures were taken on the ice by both teams, and the two teams came together for one large group photo. This is one of the best things about international hockey - despite the battles on the ice, everyone is friends off of it. Team USA is your bronze medallists at the World Deaf Ice Hockey Championships! In an hour and a half, I'll be back for the gold medal game featuring Finland and Canada. I've had a ridiculously busy day, and tomorrow is medal day at the World Deaf Hockey Championships, so I really don't have a ton of time to devote to writing anything tonight as I am glued to the NHL Playoffs. Honestly, is there anything better than the NHL Playoffs? From seeing the Philadelphia Flyers self-destruct to watching the soul-crushing style of play from the Ducks over the Sharks, the NHL Playoffs are the best time of year. It also raises the stakes for everyone involved in the game. Players play hurt, coaches hide weaknesses, and media outlets work hard to bring us all the stories that surround the mystique of the Stanley Cup Playoffs. However, there is something that needs to be said for reporting during this time of the year. Sure, reporters do their job throughout the year, and they, like everyone else, are human in so much that they make mistakes. Sometimes, they make them on air during live TV. Rarely, though, do you get the combination of "oops" and self-criticism like Rogers Sportsnet's Roger Millions gave us the other day. Parents, the term Mr. Millions uses is very NSFW or not-so-good-for-children, so please be wary when you play this. Just remember that this was said on live television. A "bit of a blooper"? Are you kidding me? That's nothing more than justification for termination, especially when said on national television. I don't blame Daren Millard, the host of HockeyCentral, for just shaking it off as a "blooper", but Millions shows exactly what not to do when one commits an error on live television. And yet Millions still has his job. Is it any wonder why TSN is leaps and bounds ahead of Sportsnet when it comes to reporting? Speaking of being way ahead, I was watching the ESPN series preview the other day, featuring EJ Hradek and Barry Melrose. Both men were quite passionate about their picks, and I commend them for breaking down the series on ESPN.com where hockey gets as much coverage as the Westminster Dog Show. The problem is that ESPN has as much hockey knowledge as the country of Ecuador. While I'm quite certain that the NFL is a huge money-maker for the "Worldwide Leader", it really speaks volumes as to how ignorant ESPN is of other sports. After all, when was the last time the Carolina Panthers made the NHL Playoffs? Worse yet, they use the Florida Panthers' logo for the broadcast! It's one thing to mess up a team name, but to screw up twice at once is the epitome of ridiculous. I'm no fan of ESPN due to their arrogance when it comes to making hockey a non-sport, but to (a) not know the teams in the NHL and (b) screw up twice when speaking of the Carolina Hurricanes franchise is unforgivable. This is yet another reason why the NHL doesn't need ESPN. 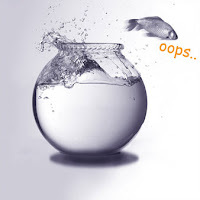 Look, I make mistakes. I even admit to them when I mess up. But in both of these cases, there was no effort in fixing the error. ESPN has pulled the video clip off their site (although I didn't check the archives). Sportsnet has Roger Millions reporting from Calgary still. Is it any wonder why neither of these sports networks are respected by hockey fans? Well, it's the very last round-robin game at the 2009 World Deaf Hockey Championships, so I better update what I missed in order to bring you up to date. I was at work the last two days, so I missed a total of three games, all of which had implications on the standings. Canada played Russia on Wednesday in the early game while the Slovaks and Americans tangled in the evening. Earlier today, the Finns and Canadians squared off, and I'm back for this evening's game between the Russians and the Americans. It needs to be said that I am still very impressed with the organizers and volunteers of the 2009 World Deaf Ice Hockey and Curling Championships. They have been extremely hospitable, overly helpful, and accommodating in every way. If you needed an example of how to run a world-class event, this event would be it. I can't say enough thanks to everyone who has helped me throughout the week. This is just a short paragraph about Wednesday because, as stated above, I wasn't at the St. James Civic Centre for those games. According to the gamesheets, Canada absolutely throttled Russia by a 17-1 score. From what I gather from the scoresheet, Canada simply hit them into submission before putting the game way out of reach. That gave Canada a 3-0 record while the Russians fell to 1-2. In the US-Slovakia game, the Americans outskated the Slovaks to a 9-1 victory. With the loss, Slovakia dropped to 0-4 for the tournament, while the Americans improved to 1-2. That win by the US squad set up two all-important matchups for Thursday's games as Finland (3-0) would play Canada (3-0) in a gold medal game preview, while the Russians (1-2) and Americans (1-2) would square off in a bronze medal game preview. Canada was the designated visiting team this afternoon in their contest against the Finns, so they took to the ice in their black jerseys while Finland skated in white. I'm not sure if this was a chance to work his backup goalie against a good Canadian team, but head coach Pekka Laakari started Arttu Liikamaa over Pauli Kitula. With nothing on the line but a win-loss record, the risk of having Kitula start and possibly get hurt might have played into the decision to start Liikamaa. Canada responded with Ryan Armitage as they wanted home-ice advantage in the gold medal game. Canada came out blazing, jumping out to a 3-0 lead by the 11:51 mark of the first period. #16 Brent Pinch opened the scoring with a shorthanded marker at 4:08. That was followed by an even-strength goal scored by #5 David Garbacz. Pinch tallied his second of the game on the powerplay at 11:51. Finland responded when #24 Janne Yrjola notched a goal at the 12:02 mark, but Canada restored the three-goal lead at 14:28 when Brent Pinch added his hat-trick goal. Yrjola scored 57 seconds later on the powerplay to cut the deficit to two goals once more, but Canada added two more before the period would end. #25 Scott Savard scored at 16:30, and #17 Mark Howitt added his goal at 18:58 to give Canada a 6-2 lead after the first period. If you didn't think this game was rough, there were 12 minor penalties called in the first period by referee Patrick Gagnon. Canada had eight of those with the majority being stick infractions. The second period only saw one goal as Canada increased its lead on a tally by #16 Brent Pinch, his fourth of the game. What is of some concern to Canadian fans is the health of goaltender Ryan Armitage. Armitage was reportedly slew-footed behind the net, causing him to fall backwards and strike his head on the ice. He was taken to the hospital for precautionary reasons, but it is worth noting that Canada cannot afford to lose another goaltender. The two teams traded goals in the third period as #7 Marko Liimatainen scored on the powerplay for Finland at 10:07 while Canada's goal came from #16 Brent Pinch. Pinch's five goals in one game are a career-best for the forward. Canada earns home ice advantage Saturday with an 8-3 victory over Finland. To make the news even better, I just got word that Armitage is ok, and should be able to dress for Saturday's rematch in the gold medal game. That's a big relief as Canada doesn't have a third goaltender listed on its roster. On to tonight's game where the Americans, in their road blues, will face Russia, who is wearing white. Both teams have little to play for aside from having the last change in the bronze medal game, so this will be interesting to see how both teams come out. There are probably 150-200 fans here for this game, so it looks like we'll have a good crowd on hand for his one! Here are your highlights from tonight's game! Just over a minute in, and the Americans are a little more physical than the Russians so far. Both teams appear to want to out-deke the other team rather than out-hit them. With 18:10 to go, #7 Doug Hyde rips a shot off the crossbar behind Russian goaltender #20 Alexander Trofimov. Still no score, but the Americans are pressing. Trofimov has given up a couple of fat rebounds that the Americans just haven't been able to corral. If he keeps this up, the US team may have a big day on the scoresheet. The Americans strike first at 15:33. #15 Miles Gates pockets a goal behind Trofimov to give the US squad the all-important first goal. USA leads 1-0. The Americans have pinned Russia in their own zone for the last two minutes with some excellent puck control and cycling. They've blocked two or three clearing attempts, and their hard work pays off. At 12:31 of the first, #21 James Crane, the captain of the American team, taps home a rebound from in front of the cage. USA leads 2-0. #4 Garrett Hepperly cruises down the left wing with 11:10 remaining in the first, and rips home a wrist shot. USA leads 3-0. The first good Russian scoring chance comes with 9:35 remaining in the first as #15 Sergey Kargin rips a shot off a tap-pass. Goaltender David Rancourt is equal to the task, however, and it remains 3-0 for the US. Tony McGaughey deposits another American goal with 11:56 remaining. It seems as though the Russians are sleepwalking out there as McGaughey had all the time in the world to put that puck home. USA leads 4-0. With three minutes to play in the first, it has been all USA thus far. They are skating harder and really controlling the play. With the Americans up 4-0, there hasn't been any real panic from the Russians. I'm not sure if they are saving themselves in order to prevent injury or they are tired, but they have not even been close to matching the American squad's intensity. Again, with nothing to play for except last changes on Saturday, I'm guessing they may be holding back. With a hooking call 34 seconds into the second period against the Americans, Russia has a five-on-three opportunity. If they want back into this game, now is their chance. No dice on the Russian powerplay as the Americans are back to full-strength. With 16:51 remaining, the Americans score again. #8 Mike Wosnoski pots his first of the game to open up a five-goal cushion for the Americans. USA leads 5-0. With 13:25 left, some pushing and shoving in front of the Russian net leads to the zebras getting in the middle. Cooler heads prevail, however. In a footrace for the puck with 11:05 to go, a Russian forward turns away from the puck as he and an American defenceman come together. I believe that the Russians don't like getting hit, especially by bigger players. Phenomenal defensive play with 8:04 to play as #24 Peter Gentoli streaks back to strip the streaking Russian forward of the puck. #14 Sergey Osipov had a step or two on Gentoli, but Gentoli's hustle is worth noting. With 6:41 remaining, #16 Aleksey Ikohnikov fires a puck past Rancourt to put the Russians on the board. USA leads 5-1. With 5:53 remaining, there is a stoppage in play as a goal is being reviewed. The Americans are claiming to have scored. Moments after referee Brett Montsion discusses with the linesmen and goal judge, he points to center ice. #7 Doug Hyde is credited with the goal. USA leads 6-1. With 4:13 remaining, a weird goal is scored. #39 Jason Kitchen fires a puck towards the net from center as he begins the dump-and-chase. The problem? Trefimov misplays it badly, and it finds the back of the net. USA leads 7-1. #17 Robert Ruef adds to the American lead with 2:49 to go in the second. His move out of the corner to the front of the net finds space under #20's pads for a goal. USA leads 8-1. #7 Doug Hyde and #21 Konstantin Bobov have words in the Russian end as the play continues up ice at the 2:26 mark. It ends with Hyde in a headlock, and Bobov being held back by a linesman. I'm not sure what happened, but these two had a bit of battle going on in front of the American net just seconds earlier. Looks like a little bad blood might be creeping into these two teams. Wow... the resulting penalties are stiff. Bobov gets four minutes for spearing, four minutes for roughing, and a ten-minute misconduct. Hyde gets two minutes for roughing. The result? A six-minute American powerplay. Ouch. Nothing comes of the powerplay in the remaining few minutes of the second, but the Americans will still have 3:34 in the third to get their powerplay units rolling. The Americans are really playing a much more disciplined game tonight, and have worked effectively to get under the skin of the Russian team. This is how I expected the Americans to play all tournament, and it looks like they might be peaking at the right time, especially with medals on the line. After I got cut off from the internet for about five minutes, I'm back to report that the Americans scored in that time. #19 Andy Howard was the goal scorer. USA leads 9-1. On a great individual effort to cause a turnover, #27 Tony McGaughey slides home a backhander to add the American total. Hard work has not been lost on the American squad. USA leads 10-1. I just noticed that the Russians have #1 Iskander Latypov in net. I guess they made the change to start the third period. As I write this, Joe Lingle comes off the bench to replace David Rancourt in the American net with just under eleven minutes to play. #4 Garrett Hepperly steps into the high slot, and rips a wrist shot that gets between Latypov's arm and body. USA leads 11-1. With 6:02 remaining, the Russians have begun to play with a lot more physicality. And it seems to be working as they are mounting regular pressure in the American zone. If this is a preview of how the bronze medal game will be on Saturday, I much prefer this hockey to the passive hockey the Russians were playing in the previous 54 minutes. Twice tonight the Russians have been caught sleeping as the linesman has blown the play in and dropped the puck in front of an American centerman with no Russian in the faceoff circle. Both times have resulted in the Russians taking a penalty as they try to recover. With 2:53 remaining, the Russians are penalized for slashing after missing a draw. With the final buzzer, we have an 11-1 victory for the American squad to even their record at 2-2, giving them home-ice advantage over the Russians, who drop to 1-3, on Saturday when they compete for the bronze medal. The last seven minutes of the game is how I expect both teams to play on the weekend - hard, fast, and physical. Player Of The Game - Russia: #15 Sergey Kargin. Player Of The Game - USA: #4 Garrett Hepperly. No games tomorrow as all the teams will be preparing for Saturday. Except Slovakia. I will say this about the Slovaks: for a first year team who has only been together six months, they never gave up and they never backed down. That shows some great heart, and they can certainly build on that foundation. Medal Saturday is the last day of the World Deaf Hockey Championships, so if you're in or around the MTS Centre in Winnipeg, come on down to see some fabulous hockey action. Tickets are a miniscule $15, and you can take in a gold medal game at 1:00pm! Everyone says I should be on Facebook or Twitter. Especially during the playoffs. Apparently, everyone is twittering... tweeting... whatevering as the networking service happens to make the playoffs a more dynamic time. Or so I'm told. Personally, I have no interest in either of these sites. I didn't even have a MySpace page when everyone else was pouring over that site, so I'm not about to break my trend. However, I am flipping channels as I sit here, so I've decided to post some random thoughts from the games I am watching. This should be interesting. Chris Drury isn't in the lineup for the Rangers. Are they mailing in the loss? Sidney Crosby has scored the first goal of the 2009 NHL Stanley Cup Playoffs. Gatorade and Reebok began working on new commercials immediately. Is Wade Redden a graduate of the "Alexei Yashin Magic School"? He's been invisible all season long. Ovechkin looks like a man possessed. The only problem? Henrik Lundqvist is practicing voodoo in the crease. King Henry looks phenomenal so far. I called America's Most Wanted a few seconds ago. John Walsh is officially putting an APB out for Wade Redden. Mike Mottau - he who scored one goal all season - has New Jersey's first goal of the playoffs. Brian Burke is already on the phone with Lou Lamoriello. Scott Hartnell's hair makes him look like Sideshow Bob. I'm glad he lives up to the first half of that moniker. I could be wrong here, but Jose Theodore should probably take advantage of his company's vision benefits. He definitely needs glasses. Just had to check the calendar. I thought it might be Halloween. FREE CANDY all over the ice in Pittsburgh. Eric Staal left the ice midway through the second period. He's in the dressing room filling out a temporary restraining order against John Madden. The greatest trick the New Jersey Devils ever pulled was convincing the world they didn't care. Carolina is finding out the hard way. CBC's Scott Oake says that Vancouver has "playoff fever". I wonder if Mats Sundin has caught it yet? TSN's Gord Miller points out that Viktor Kozlov has never played on a team that has won a playoff series. Kozlov is 0-6 in playoff series. The Rangers' penalty kill is a passive box. My advice for John Tortorella? Send out a second goaltender. Your defence isn't doing a damned thing to stop Washington. Just in case people are wondering, Dan Bylsma coached the Wilkes-Barre/Scranton Penguins to the AHL Calder Cup Championship series last season. Stop talking about him like he just walked in off the street, ok? Alexander Ovechkin was using another player's helmet for almost one minute. His helmet was knocked off, so he grabbed a helmet from one of the Capitals. Weird. Philadelphia must be going through some serious "déja vu" because the Penguins are dominating that game. I'm pretty sure that Theodore has no idea what that leather thing is on his right hand. Maybe Boudreau should get him another blocker? TSN just flashed on the screen that Redden has an assist in tonight's game. I had no clue he had booked the arena for his magic tour. Redden is the NHL's David Blaine. Did they replace the Mellon Arena with a woodshed? Flyers are getting spanked. Henrik Lundqvist is unconscious in the net. If it weren't for him, the Capitals may lead by 20 or 30 goals. Easily. Who'da thunk that the New York Rangers Henrik Lundqvist would win Game One of the Rangers-Capitals series? Philly seems to think that the Broad Street Bullies are back. Alberts with a hard slash, and then Parent with a hit from behind. Sideshow Scott was sent to the dressing room. Coburn and Guerin hug each other passionately. That wasn't a fight. New York has defeated Washington by a 4-3 score. Pittsburgh has defeated Philadelphia by a 4-1 score. New Jersey has defeated Carolina by a 4-1 score. Alright, that was fun. But I'm still not joining Twitter, Facebook, MySpace or any other site like that. If you want to yap about my comments, leave me a comment and I will respond! I always love a good discussion.